For three decades brash Yankee owner, George Steinbrenner and his team have grabbed headlines, signed superstars, gotten into fights, changed managers, won and lost games, and become a New York institution.. Now, sportswriter Maury Allen takes you behind the scenes to chronicle George's reign--and how the Yankees went from being the Bronx Zoo to the classiest, most successful organization in baseball today. Here are inside stories on Yankee greats including babe Ruth, Mickey Mantle, and Joe DiMaggio, and revealing, in-depth portraits of current superstars such as Derek Jeter, Bernie Williams, El Duque, Roger Clemens, David Cone, Daryl Strawberry, Mariano Rivera and Joe Torre. Along the way, we are treated to some amazing on-the-field--and off-the-field--action as seen by a journalist who has known three generation of Yankees up-close and personal. 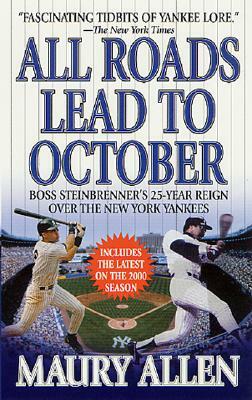 Exciting and irreverent, "All Roads Lead to October "is the definitive account of twenty-five years of baseball glory--New York Yankee style.